John F. Kennedy's loyal White House aides, Kenneth O'Donnell and Dave Powers, titled their 1972 J.F.K. memoir Johnny, We Hardly Knew Ye -- despite the fact that they had served him since his days as a scrawny young congressional candidate in Boston. So it's no surprise that Americans are still trying to figure out nearly half a century after his abbreviated presidency who Jack Kennedy really was. Was he a cold war hawk, as much of the history establishment, Washington pundit class and presidential hopefuls of both parties -- eager to lay claim to his mantle of muscular leadership -- have insisted over the years? Or was he a man ahead of his time, a peace-minded visionary trying to untie the nuclear knot that held hostage the U.S. and the Soviet Union -- and the rest of the world? As the U.S. once again finds itself in an endless war -- this time against terror, or perhaps against fear itself -- the question of Kennedy's true legacy seems particularly loaded. What is the best way for America to navigate through a world where its enemies seem everywhere and nowhere at the same time? What can we learn from the way Kennedy was trying to redefine the U.S. role in the world and to invite Americans to be part of that change? Who was the real John Fitzgerald Kennedy? The conundrum begins with Kennedy himself, a politically complex man whose speeches often brandished arrows as well as olive branches. This seemingly contradictory message was vividly communicated in J.F.K. 's famous Inaugural Address. While Kennedy vowed the nation "would pay any price, bear any burden, meet any hardship, support any friend, oppose any foe to assure the survival and success of liberty" -- aggressive rhetoric that would fit right in with George W. Bush's presidency -- the young leader also dispensed with the usual Soviet bashing of his time and invited our enemy to join us in a new "quest for peace, before the dark powers of destruction unleashed by science engulf all of humanity." It would be hard to imagine the current occupant of the White House extending the same offer to Islamic jihadists or Iran's leaders. Young Jack Kennedy developed a deep, visceral disgust for war because of his -- and his family's -- experiences in it. "All war is stupid," he wrote home from his PT boat in the Pacific battleground of World War II. That war destroyed the family's sense of godlike invincibility. His older brother Joe -- a Navy pilot -- died in a fiery explosion over the English Channel after volunteering for a high-risk mission, and the young husband of "Kick" Kennedy, J.F.K. 's beloved sister, was also killed. As Jack wrote to Claiborne Pell in 1947, the war had simply "savaged" his family. "It turned my father and brothers and sisters and I upside down and sucked all the oxygen out of our smug and comfortable assumptions... Now, after all that we experienced and lost in the war, we finally understand that there is nothing inevitable about us." But Kennedy and his brothers were also bred to be winners by their father -- to never accept defeat. And when he entered the 1960 presidential campaign against Richard Nixon, one of the dirtiest fighters in the American political arena, he was prepared to do whatever it took to prevail. At the height of the cold war, that meant positioning himself as even more of a hawk than his Republican opponent. Kennedy had no interest in becoming another Adlai Stevenson -- the high-minded liberal who was easily defeated in back-to-back elections by war hero Dwight Eisenhower. J.F.K. was determined not to be turned into a weakling on defense, a punching bag for two-fisted GOP rhetoric. So he outflanked Nixon, warning that the country was falling behind Russia in the nuclear arms race and turning "the missile gap" into a major campaign theme. Kennedy also championed the cause of Cuban "freedom fighters" in their crusade to take back the island from Fidel Castro's newly victorious regime. Liberal Kennedy supporters, such as Harvard economist John Kenneth Galbraith, were worried that J.F.K. would later pay a price for this bellicose campaign rhetoric. But Kennedy's tough posture helped secure him a wafer-thin victory on Election Day. Working with the newly elected President at the Kennedy family's Palm Beach villa in early January 1961, speechwriter Theodore Sorensen struggled to interweave the two sides of J.F.K. as the two men crafted the President-elect's Inaugural speech. Looking back, says Sorensen today, the most important line of that ringing address wasn't, "Ask not what your country can do for you -- ask what you can do for your country." It was, "For only when our arms are sufficient beyond doubt can we be certain beyond doubt that they will never be employed." This peace-through-strength message "was the Kennedy policy in a nutshell," Sorensen observes. But the Pentagon and CIA hard-liners who thrilled to the more robust strains of Kennedy's soaring Inaugural message wanted not only the massive arms buildup that the new President promised. They wanted also to employ this fearsome arsenal to push back communist advances around the world. And no enemy bastion was more nettlesome to these national-security officials than Castro's Cuba, less than 100 miles off U.S. shores. Washington's national-security apparatus had decided there was no living with Castro. During the final months of the Eisenhower Administration, the CIA started planning an invasion of the island, recruiting Cuban exiles who had fled the new regime. Agency officials assured the young President who inherited the invasion plan that it was a "slam dunk," in the words of a future CIA director contemplating another ill-fated U.S. invasion. J.F.K. had deep misgivings, but unwilling to overrule his senior intelligence officials so early in his Administration, he went fatefully ahead with the plan. The doomed Bay of Pigs invasion in April 1961 became the Kennedy Administration's first great trauma. We now know -- from the CIA's internal history of the Bay of Pigs, which was declassified in 2005 -- that agency officials realized their motley crew of invaders had no chance of victory unless they were reinforced by the U.S. military. But Allen Dulles and Richard Bissell, the top CIA officials, never disclosed this to J.F.K. They clearly thought the young President would cave in the heat of battle, that he would be forced to send in the Marines and Air Force to rescue the beleaguered exiles brigade after it was pinned down on the beaches by Castro's forces. But Kennedy -- who was concerned about aggravating the U.S. image in Latin America as a Yanqui bully and also feared a Soviet countermove against West Berlin -- had warned agency officials that he would not fully intervene. As the invasion quickly bogged down at the swampy landing site, J.F.K. stunned Dulles and Bissell by standing his ground and refusing to escalate the assault. From that point on, the Kennedy presidency became a government at war with itself. A bitter Dulles thought Kennedy had suffered a failure of nerve and observed that he was "surrounded by doubting Thomases and admirers of Castro." The Joint Chiefs also muttered darkly about the new President. General Lyman Lemnitzer, Chairman of the Joint Chiefs, said "pulling out the rug [on the invaders ]was... absolutely reprehensible, almost criminal." Admiral Arleigh Burke, the Navy chief, later fumed, "Mr. Kennedy was a very bad President... He permitted himself to jeopardize the nation." Kennedy was equally outraged at his national-security advisers. While he famously took responsibility for the Bay of Pigs debacle in public, privately he lashed out at the Joint Chiefs and especially at the CIA, threatening to "shatter [the agency] into a thousand pieces and scatter it to the winds." J.F.K. never followed through on this threat, but he did eventually fire Dulles, despite his stature as a legendary spymaster, as well as Bissell. Weeks after the Cuba fiasco, J.F.K. was still steaming, recalled his friend Assistant Navy Secretary Paul (Red) Fay years later in his memoir, The Pleasure of His Company. "Nobody is going to force me to do anything I don't think is in the best interest of the country," the President told his friend, over a game of checkers at the Kennedy-family compound in Hyannis Port, Mass. "We're not going to plunge into an irresponsible action just because a fanatical fringe in this country puts so-called national pride above national reason. Do you think I'm going to carry on my conscience the responsibility for the wanton maiming and killing of children like our children we saw [playing] here this evening? Do you think I'm going to cause a nuclear exchange -- for what? Because I was forced into doing something that I didn't think was proper and right? Well, if you or anybody else thinks I am, he's crazy." This would become the major theme of the Kennedy presidency -- J.F.K. 's strenuous efforts to keep the country at peace in the face of equally ardent pressures from Washington's warrior caste to go to war. Caught between the communist challenges in Laos, Berlin, Vietnam and Latin America and the bellicosity of his national-security élite, Kennedy again and again found a way to sidestep war. In each crisis, he improvised a strategy -- combining rhetoric that was alternately tough and conciliatory with aggressive backdoor diplomacy -- that found the way to a peaceful resolution. Kennedy never again trusted his generals and espionage chiefs after the 1961 fiasco in Cuba, and he became a master at artfully deflecting their militant counsel. "After the Bay of Pigs, Kennedy had contempt for the Joint Chiefs," historian Arthur Schlesinger Jr. recalled over drinks in the hushed, stately rooms of New York City's Century Club not long before his death. "I remember going into his office in the spring of 1961, where he waved some cables at me from General Lemnitzer, who was then in Laos on an inspection tour. And Kennedy said, 'If it hadn't been for the Bay of Pigs, I might have been impressed by this.' I think J.F.K. 's war-hero status allowed him to defy the Joint Chiefs. He dismissed them as a bunch of old men. He thought Lemnitzer was a dope." President Kennedy never thought much of the CIA either, in part because he and his indispensable brother, Attorney General Robert Kennedy, became convinced that the agency was not just incompetent but also a rogue operation. After the Bay of Pigs -- and particularly the Cuban missile crisis -- the Kennedys seemed more concerned with defusing Cuba as a political issue at home, where it was a rallying cry on the right, than with actually enforcing a regime change. The darker efforts against Castro -- the sinister CIA plots to assassinate him in partnership with the Mafia -- began before the Kennedy Administration and continued after it ended. Robert Kennedy -- a legendary crusader against organized crime -- thought he had shut down the murder plots after two CIA officials sheepishly informed him of the agency's pact with the Mob in May 1962. But there was much that the Kennedys did not know about the agency's more shadowy operations. Nor did President Kennedy have a firm hand on the Pentagon. "Certainly we did not control the Joint Chiefs of Staff," said Schlesinger, looking back at the Kennedy White House. It was a chilling observation, considering the throbbing nuclear tensions of the period. The former White House aide revealed that J.F.K. was less afraid of Soviet leader Nikita Khrushchev's ordering a surprise attack than he was "that something would go wrong in a Dr. Strangelove kind of way" -- with a politically unstable U.S. general snapping and launching World War III. Fearing a backlash from his generals and the right -- under the feisty leadership of Barry Goldwater, his likely opponent in the upcoming presidential race -- Kennedy never made his Vietnam plans public. And, in true Kennedy fashion, his statements on the Southeast Asian conflict were a blur of ambiguity. Surrounded by national-security advisers bent on escalation and trying to prevent a public split within his Administration, Kennedy operated on "multiple levels of deception" in his Vietnam decision making, in the words of historian Gareth Porter. Today's hawks like to claim J.F.K. as one of their heroes by pointing to his steep increase in defense spending and to defiant speeches like his June 1963 denunciation of communist tyranny in the shadow of the Berlin Wall. It is certainly true that Kennedy brought a new vigor to the global duel with the Soviet Union and its client governments. But it is also clear that Kennedy preferred to compete ideologically and economically with the communist system than engage with the enemy militarily. He was supremely confident that the advantages of the capitalist system would ultimately prevail, as long as a nuclear catastrophe could be avoided. In the final months of his Administration, J.F.K. even opened a secret peace channel to Castro, led by U.N. diplomat William Attwood. "He would have recognized Cuba," Milt Ebbins, a Hollywood crony of J.F.K. 's, says today. "He told me that if we recognize Cuba, they'll buy our refrigerators and toasters, and they'll end up kicking Castro out." Kennedy often said he wanted his epitaph to be "He kept the peace." 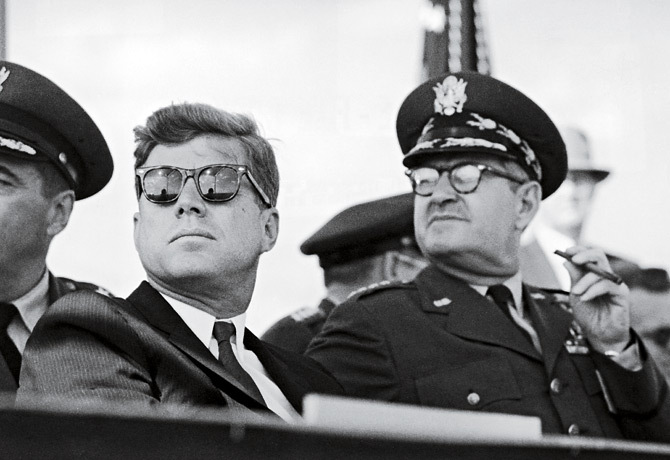 Even Khrushchev and Castro, Kennedy's toughest foreign adversaries, came to appreciate J.F.K. 's commitment to that goal. The roly-poly Soviet leader, clowning and growling, had thrown the young President off his game when they met at the Vienna summit in 1961. But after weathering storms like the Cuban missile crisis, the two leaders had settled into a mutually respectful quest for détente. When Khrushchev got the news from Dallas in November 1963, he broke down and sobbed in the Kremlin, unable to perform his duties for days. Despite his youth, Kennedy was a "real statesman," Khrushchev later wrote in his memoir, after he was pushed from power less than a year following J.F.K. 's death. If Kennedy had lived, he wrote, the two men could have brought peace to the world. Castro too had come to see J.F.K. as an agent of change, despite their long and bitter jousting, declaring that Kennedy had the potential to become "the greatest President" in U.S. history. Tellingly, the Cuban leader never blamed the Kennedys for the numerous assassination attempts on him. Years later, when Bobby Kennedy's widow Ethel made a trip to Havana, she assured Castro that "Jack and Bobby had nothing to do with the plots to kill you." The tall, graying leader -- who had survived so long in part because of his network of informers in the U.S. -- looked down at her and said, "I know." J.F.K. was slow to define his global vision, but under withering attacks from an increasingly energized right, he finally began to do so toward the end of his first year in office. Taking to the road in the fall of 1961, he told the American people why his efforts to extricate the world from the cold war's death grip made more sense than the right's militaristic solutions. On Nov. 16, Kennedy delivered a landmark speech at the University of Washington campus in Seattle. There was nothing "soft," he declared that day, about averting nuclear war -- America showed its true strength by refraining from military force until all other avenues were exhausted. And then Kennedy made a remarkable acknowledgment about the limits of U.S. power -- one that seemed to reject his Inaugural commitment to "oppose any foe" in the world. "We must face the fact that the United States is neither omnipotent nor omniscient, that we are only 6% of the world's population, that we cannot impose our will upon the other 94% of mankind, that we cannot right every wrong or reverse each adversity, and that therefore there cannot be an American solution to every world problem." Sorensen -- the young progressive raised in a pacifist, Unitarian household who helped write the speech -- calls it today "one of Kennedy's great speeches on foreign policy." If J.F.K. had lived, he adds, "there is no doubt in my mind [that] we would have laid the groundwork for détente. The cold war would have ended much sooner than it did." Kennedy reached another visionary pinnacle on June 10, 1963, when -- eager to break the diplomatic deadlock with the Soviet Union -- he gave wing to the most poetic foreign policy speech of his life, a speech that would go down in history as the "Peace Speech." In this stirring address, J.F.K. would do something that no other President during the cold war -- and no American leader today -- would dare. He attempted to humanize our enemy. No matter how "profoundly repugnant" we might find our foes' ideology or system of government, he told the American public, they are still -- like us -- human beings. And then Kennedy launched into a passage of such sweeping eloquence and empathy for the Russian people -- the enemy that a generation of Americans had been taught to fear and despise -- that it still has the power to inspire. "We all inhabit this small planet. We all breathe the same air. We all cherish our children's future. And we are all mortal." The following month, the U.S. and the Soviet Union reached agreement on the Limited Test Ban Treaty, the first significant restraint put on the superpowers' doomsday arms race. The speech that Kennedy was scheduled to deliver in Dallas on Nov. 22, 1963, was to strike a similar peace chord. It was a courageous address to give in the Texas city, a seething hotbed of anti-Kennedy passions. Dallas had voted for Nixon in 1960 by the widest margin of any major city. It was the base of far-right agitators like General Edwin Walker, who after being forced into retirement by the Kennedy Administration, had launched a national crusade against J.F.K. 's "defeatist" foreign policy and "socialistic" domestic agenda. The day of the President's Dallas motorcade, angry street posters and an ad in the Dallas Morning News accused J.F.K. of treason. But Kennedy was undeterred. This is what he planned to tell his audience at the Dallas Trade Mart that afternoon: The most effective way to demonstrate America's strength was not to threaten its enemies. It was to live up to the country's democratic ideals and "practice what it preaches about equal rights and social justice." Immediately after John F. Kennedy's death, he was wrapped in gauzy myths of Arthurian gallantry. In more recent years, he has suffered from a revisionist backlash, portrayed in books and the media as a decadent prince who put the nation at risk with his reckless personal behavior. Journalist Christopher Hitchens has gone so far as to dismiss him as a "vulgar hoodlum." While Kennedy's private life would certainly not pass today's public scrutiny, this pathological interpretation misses the essential story of his presidency. There was a heroic grandeur to John F. Kennedy's Administration that had nothing to do with the mists of Camelot. It was a presidency that clashed with its times and found some measure of greatness. At the height of the cold war, Kennedy found a way to inch back from the nuclear precipice. Under relentless pressures to go to war, he kept the peace. He talked to his enemies; he recognized the limits of American power; he understood that our true power came from our democratic ideals, not our military prowess. He is still a man ahead of his time.